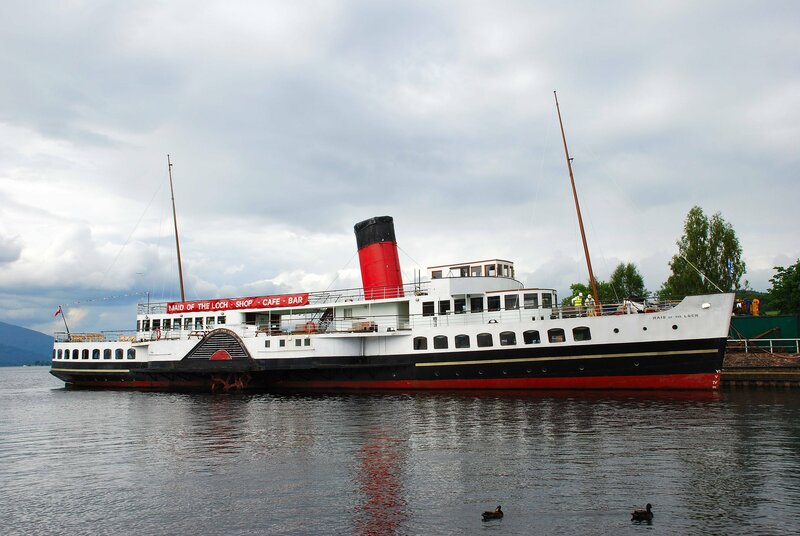 The last major paddle steamer to be built in the UK, MAID OF THE LOCH sailed on Loch Lomond from 1953 until 1981 and later became a static restaurant and exhibition ship there. Ordered in 1950 by the British Transport Commission from A. 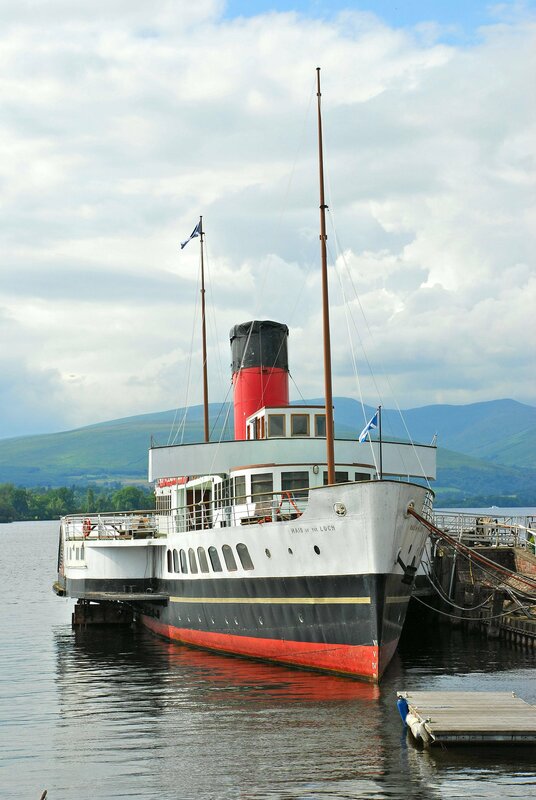 & J. Inglis of Pointhouse, Glasgow, she was built and then cut into sections for transportation by rail to Balloch on Loch Lomond. 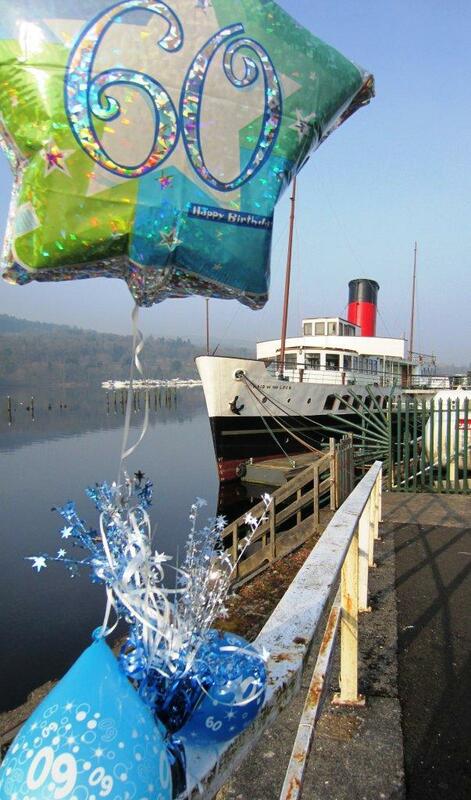 There she was re-assembled and was launched, almost complete, without ceremony, on 5 March 1953. 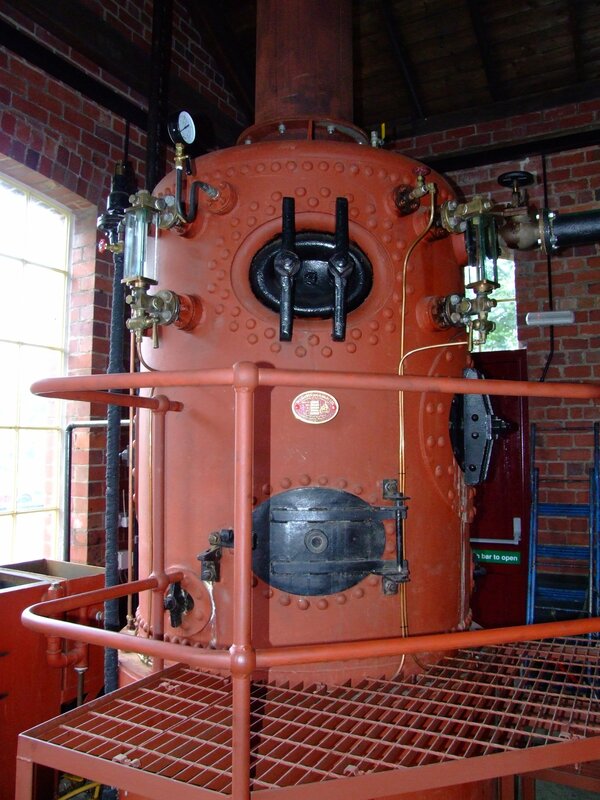 Her two-cylinder compound diagonal engine was built by Rankin & Blackmore of Greenock. 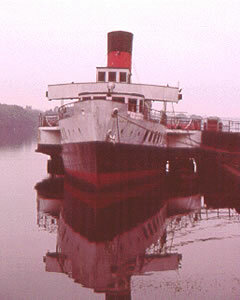 She was painted white overall with green boot-topping, a buff funnel, and had the British Railways lion and wheel crest on her bows. 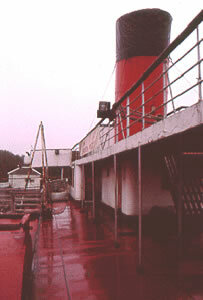 In the 1975 season, her funnel colour was red with a black top. 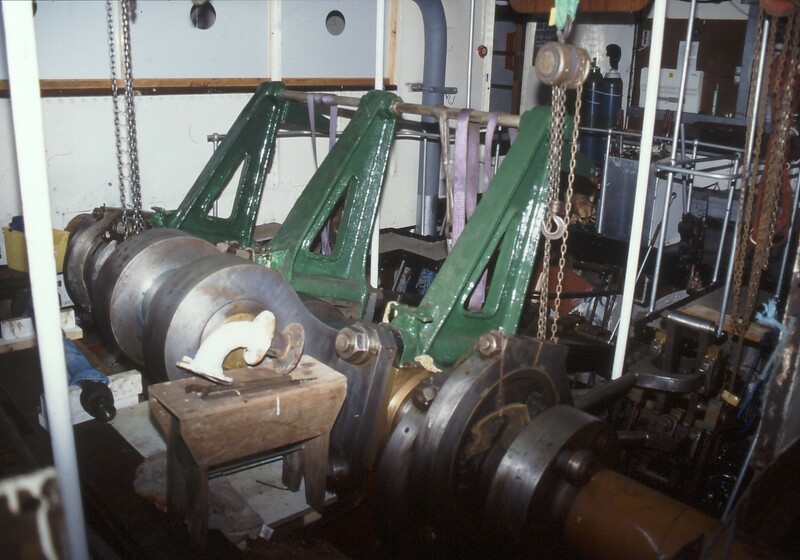 Her mainmast was removed in 1978. 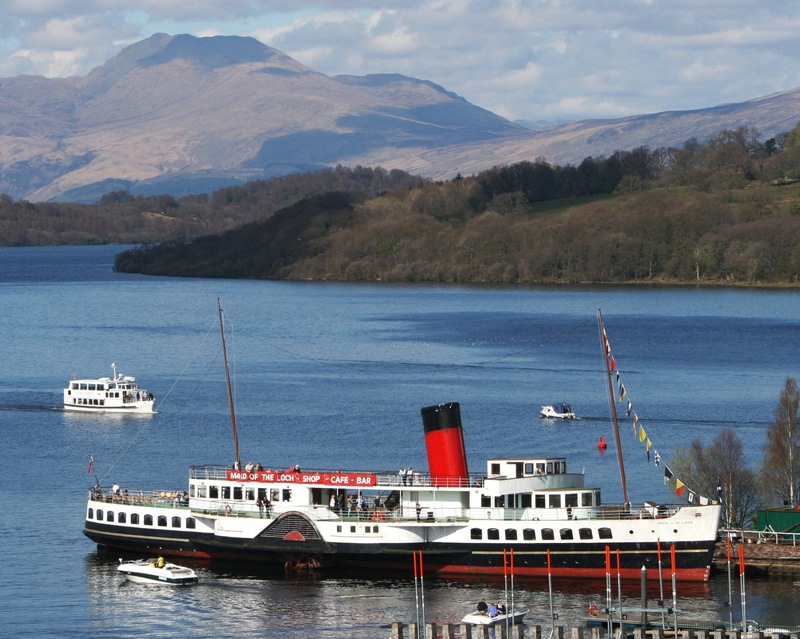 A service had first been initiated on Loch Lomond in 1818, and it is believed that this was the first regular passenger steamer service on an inland lake anywhere in the world. 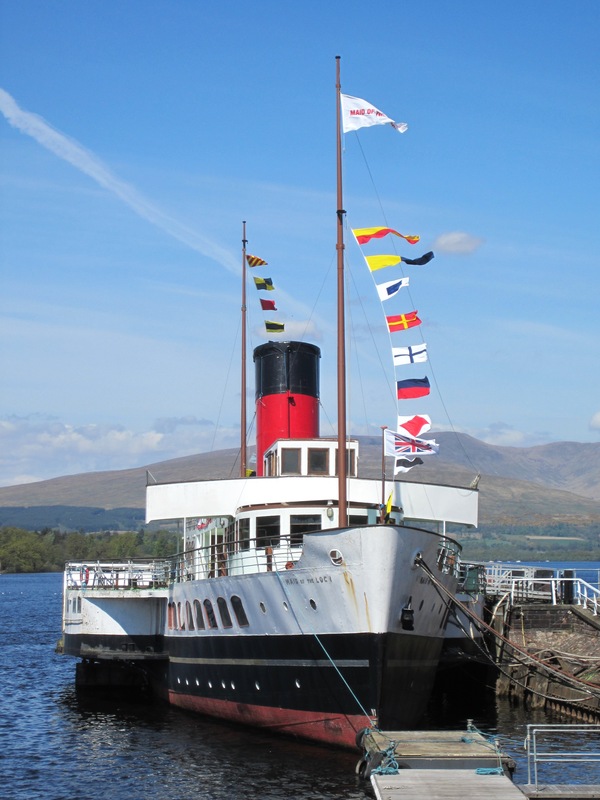 MAID OF THE LOCH was the twentieth paddle steamer to have sailed on Loch Lomond. 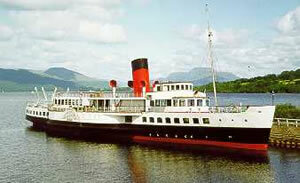 She ran trials on 4 May 1953 and was named at a ceremony on 22 May, prior to a special cruise to Ardlui. 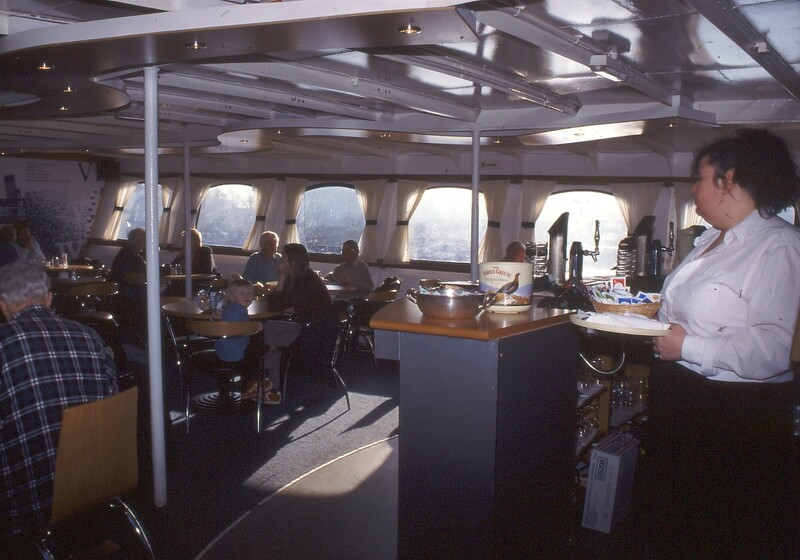 The maiden cruise with fare-paying passengers took place on 25 May. 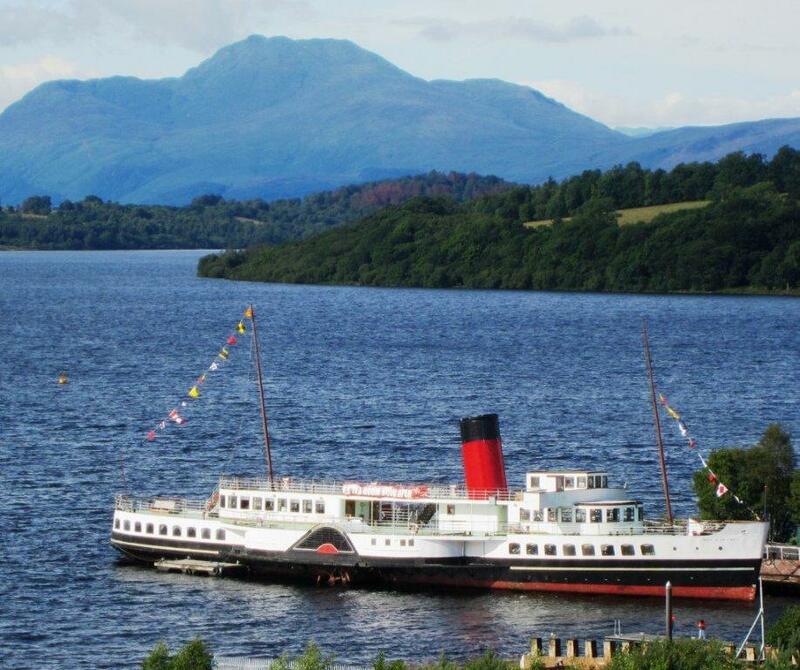 Her regular route took her from Balloch to Ardlui with calls in either direction at Balmaha, Rowardennan, Tarbet and Inversnaid. 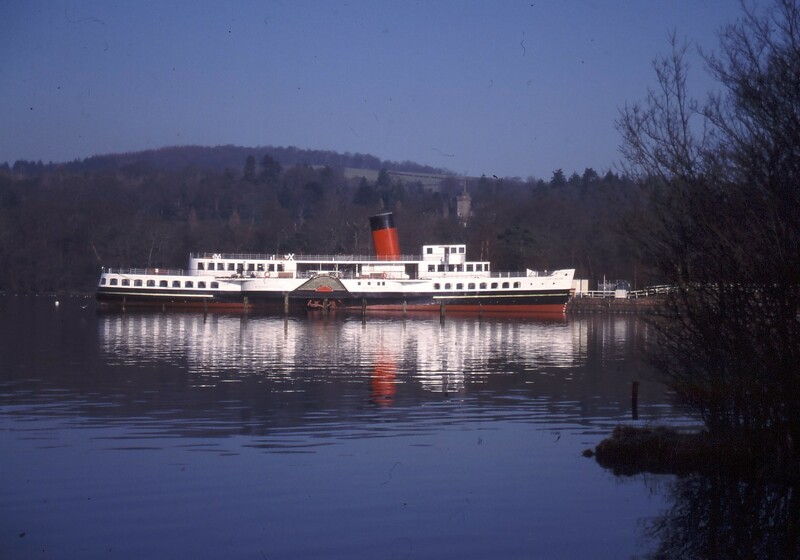 From 1964, MAID OF THE LOCH terminated at Inversnaid following the closure of the pier at Ardlui, though cruises to the Head of the Lake were also operated. During each winter she was laid up. 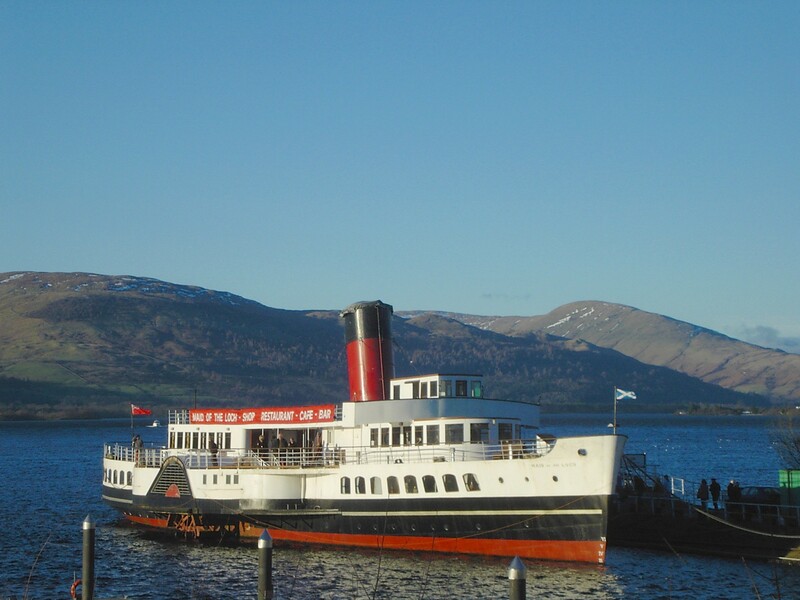 The Caledonian Steam Packet Company took over the ship in 1957, followed in 1969 by the Scottish Transport Group, and in 1970 by William Alexander & Sons - when the British Railways emblem was removed. 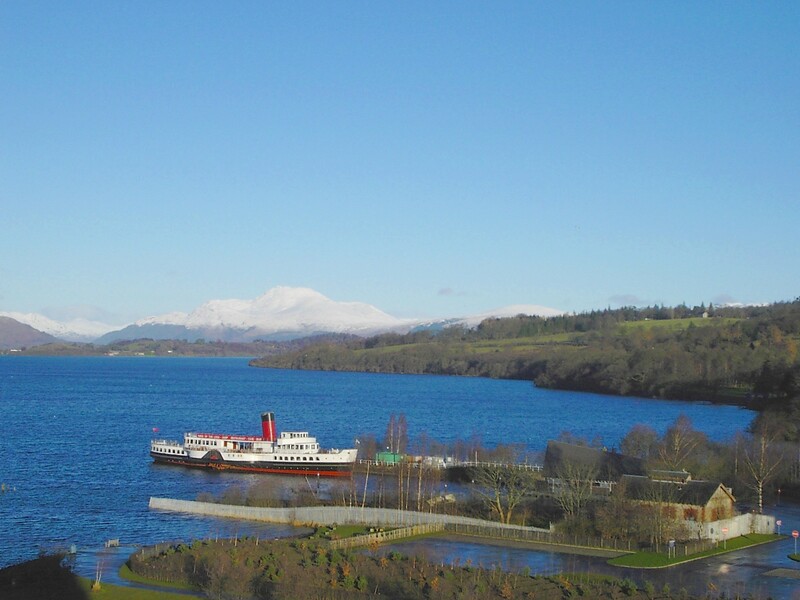 In 1992, MAID OF THE LOCH was acquired by Dumbarton District Council and efforts to save the ship began with volunteer working parties; at the end of 1995, she was tansferred to the MAID OF THE LOCH Trust prior to the establishment of the Loch Lomond Steamship Company, a registered charity. 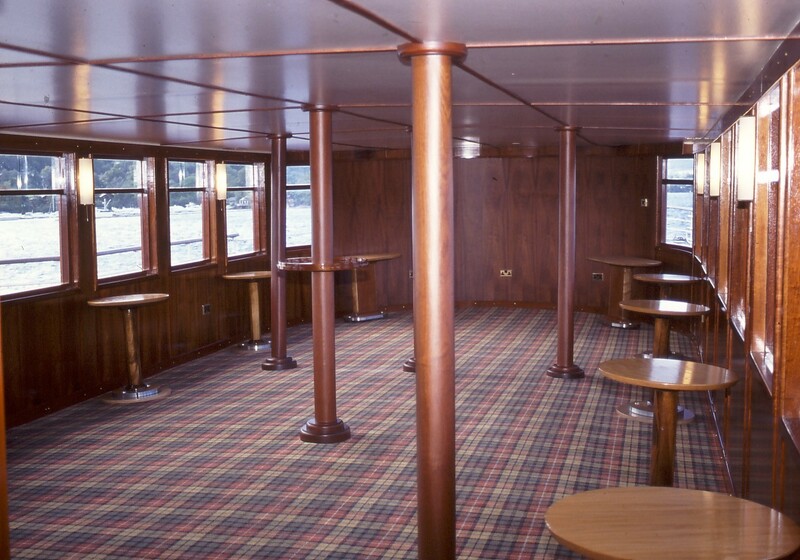 In 1997, her wooden deck was replaced with steel. 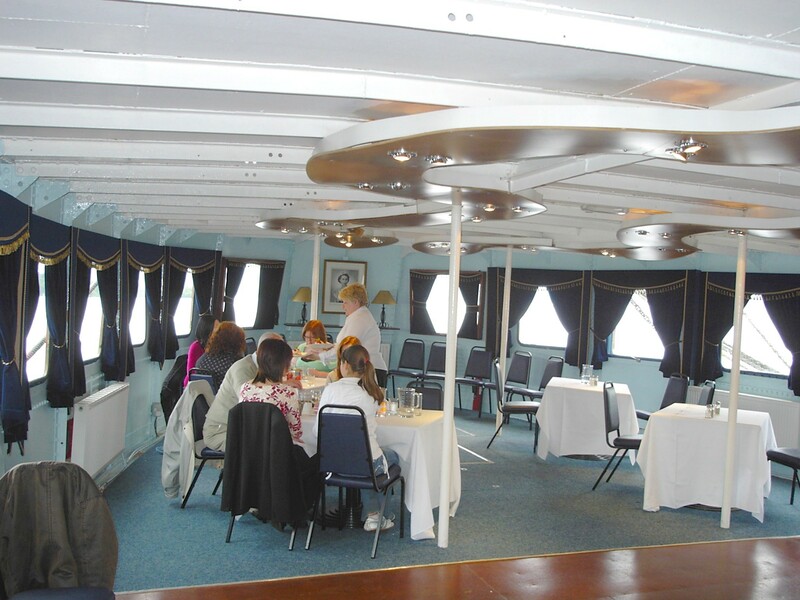 Her lower hull was painted black, with ref boot-topping, above which the main deck sides and the superstructure remained white, but the funnel was now red with a black top. 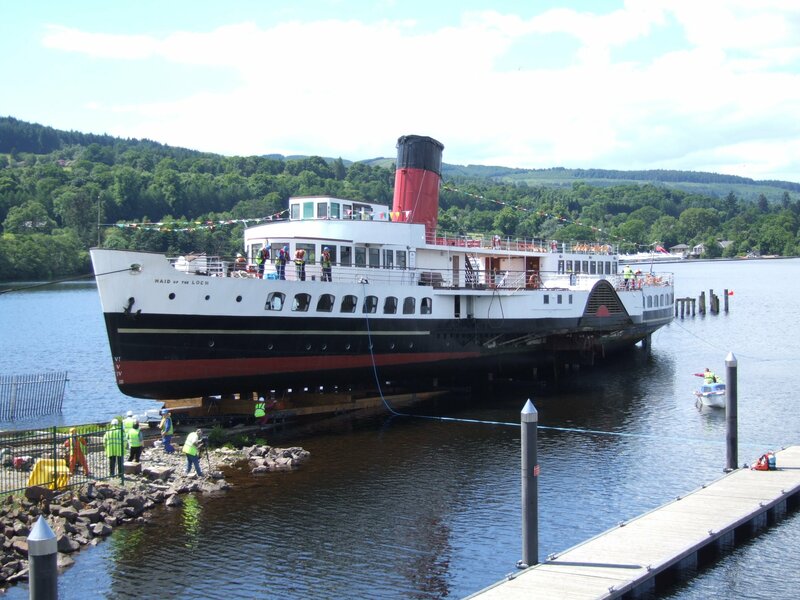 Following the restoration of the steam-powered slipway at Balloch, she was hauled out of the water in June 2006 (for inspection) for the first time since her withdrawal, as part of her rebuild - the objective of which is to return her to service. 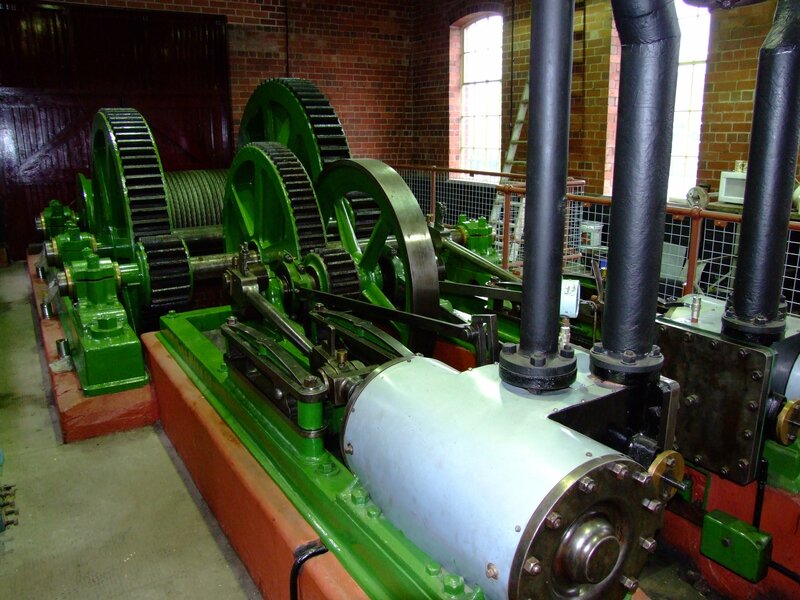 This latest achievement was thanks to a £620,000 funding package from the Heritage Lottery Fund, Scottish Enterprise Dunbartonshire, West Dunbartonshire Council and LLSC. 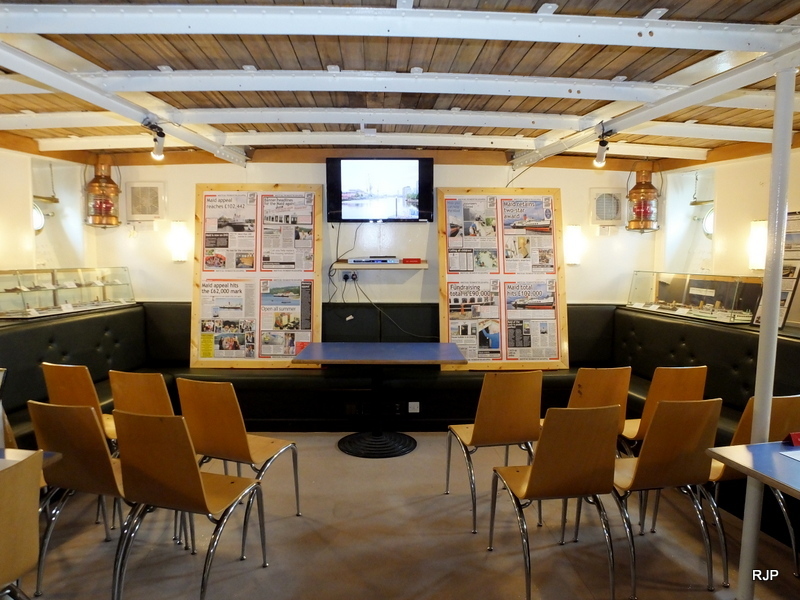 An internal refurbishment of the winchhouse, creation of a visitor interpretation facility and external landscaping is also planned. 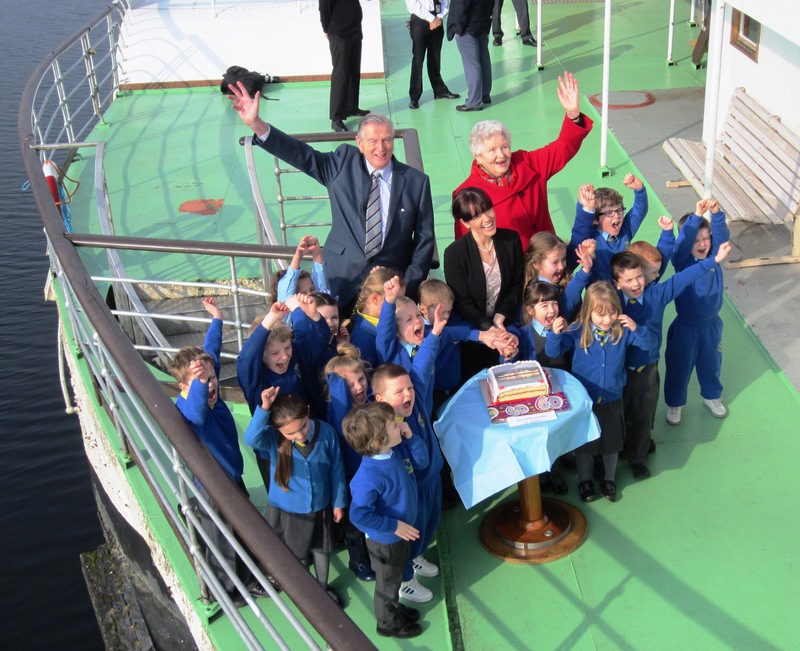 In December 2018, the Scottish Government announced it had awarded a £950,000 capital grant. 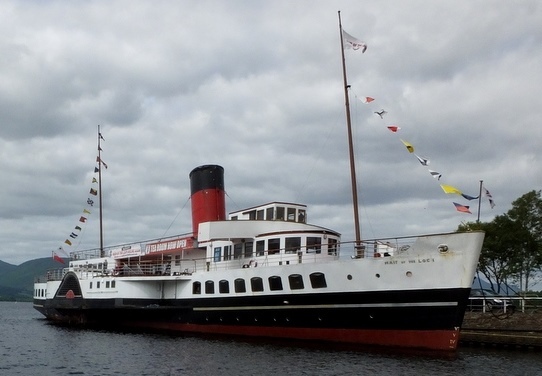 The Paddle Steamer Preservation Society also confirmed that a grant of £50,000 will still be granted, taking this working package to £1million. 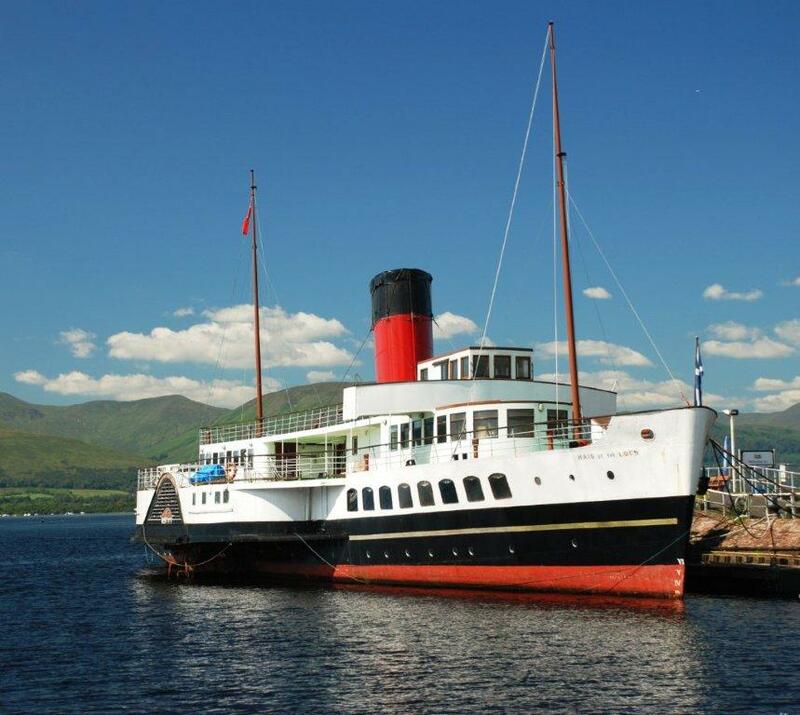 Funding will be spent on repairs to the vessel's hull, creation of an education facility on board, refurbishing the main function suite and overhauling the engines to enable them to turn with steam.